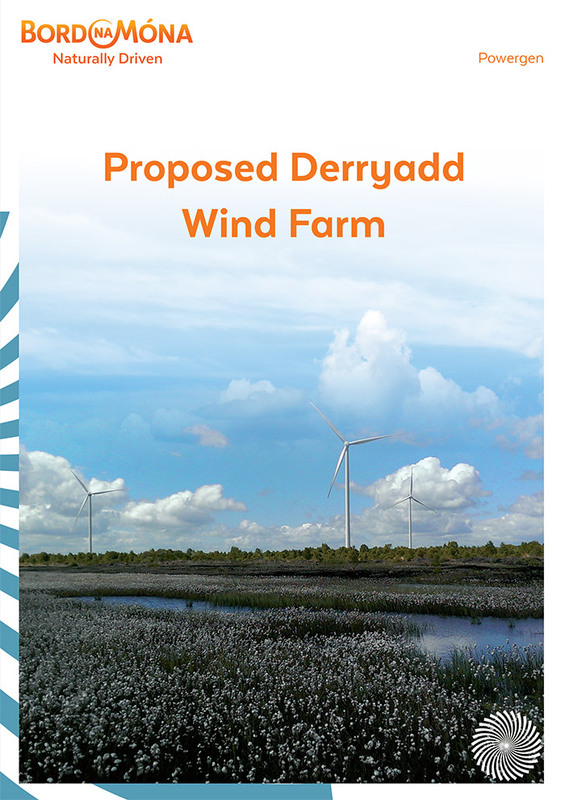 On 31st January 2019, Bord na Móna Powergen Ltd submitted a planning application to An Bord Pleanála (ABP) for the proposed Derryadd Wind Farm. Offices of Longford County Council, Great Water St. Longford. Offices of An Bord Pleanála, 64 Marlborough St, Rotunda, Dublin 1. A copy will also be available for viewing by appointment at Bord na Móna Mountdillon Works, Clonfower, Lanesborough, Longford N39 FV44. To view the planning application at this location please contact our Community Liaison Officer – James on 087-7087022 to arrange a suitable time. Bord na Móna publish revised layout for proposed Derryadd Wind Farm. Amendments to the previous layout of the wind farm arose due to announcement by way of press release on the 13th of June 2017, by the then Minister for Housing, Planning and Local Government, Simon Coveney T.D, and the Minister for Communications, Climate Action and Environment, Denis Naughten T.D., stating that they had developed a Preferred Draft Approach to wind energy development in Ireland. The revised layout reviewed setback distances, the height of the turbines and subsequently the number of turbines against the new draft criteria outlined in the Preferred Draft Approach. 1. The new layout consists of 24 turbines compared to the previous design of 28 turbines and initial design of 29 turbines. Representing a 17 percent reduction in turbines. 2. Bord na Móna Powergen intend to seek planning permission for turbines with a ground to blade tip height of up to 185 meters. Within this size envelope, various configurations of hub height, rotor diameter, and ground to blade tip height may be used. Should the project be consented the exact make and model of the turbine will be dictated by a competitive tender process, but it will not exceed a maximum tip height of 185 metres. The previous design incorporated ground to blade tip height of up to 170 meters. Representing a 9 percent increase in turbine height. 3. Setback Distance: The Preferred Draft Approach states that “A visual amenity setback of four times the turbine height between a wind turbine and the nearest residential property, subject to a mandatory minimum distance of 500 metres” should apply to wind energy developments. Due to a combination of constraints, the distance to the nearest house from a turbine on the proposed layout is 750 meters. This is in excess of 4 times turbine height setback (740 meters). The setback distance on the previous layout was 650 meters. Representing a 15 percent increase in setback distance. Due to the announcement by way of press release on the 13th of June 2017, by the then Minister for Housing, Planning and Local Government, Simon Coveney T.D, and the Minister for Communications, Climate Action and Environment, Denis Naughten T.D., stating that they have developed a Preferred Draft Approach to wind energy development in Ireland, Bord na Móna decided to delay the submission of the planning application for the proposed Derryadd Wind Farm. 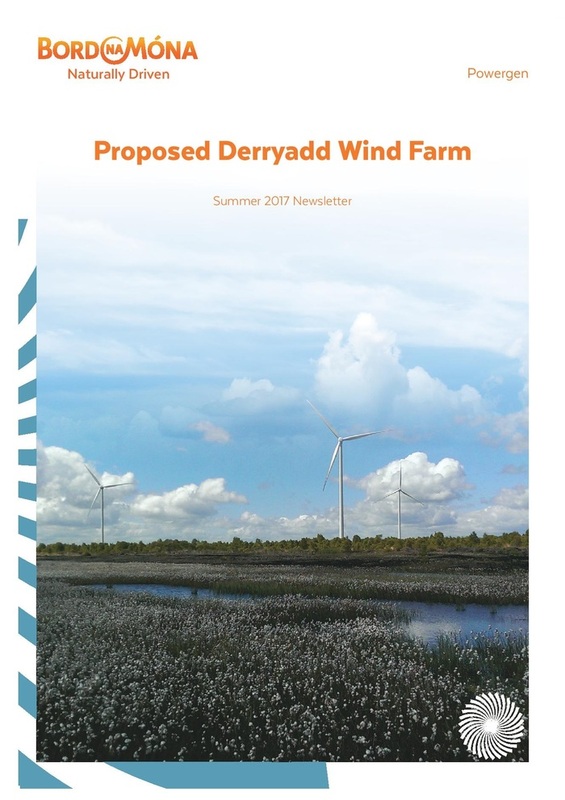 The Company considered the information made available within the press release as well as the subsequent “Information Note” issued as to how this draft approach might influence the planning application for the proposed Derryadd Wind Farm. Based on the review of this information, the Company has decided to incorporate elements of these aspects into the design for the proposed wind farm at this stage and will revisit the wind farm design and layout. The revised layout will review the height of turbines, setback distances and the proposed location of the turbines against the new draft criteria outlined in the Preferred Draft Approach. It is envisaged that the Company will be a position to provide an update on a revised layout by the end of the year. The proposed substation locations and entrances will not change location. Prior to the issue of the Preferred Draft Approach, the estimated planning application date for the development was the end of August 2017. It is now envisaged that the planning application date will now be delayed until April 2018. It is envisaged that the planning application date will now be delayed beyond the original target of August 2017. We will continue to keep you updated on any developments in this area. Based on feedback received from the public that ground conditions would be unsuitable for the proposed substation on the south-west of Derryadd Bog detailed site investigation work was carried out. Based on these findings, the proposed location has been moved to the eastern side of the railway line in that area. Please download the map to see proposed location. The proposed amenity plan has been revised based on feedback from consultation with key stakeholders. The proposed plan now includes 21 km of cycleway standard infrastructure. Please download the amenity map to view the proposed plan. There are currently no upcoming public events. Bord na Móna would like to thank everyone who attended the Public Consultations held in January and September/October 2016. Public Consultation sessions were held in Keenagh, Killashee, Lanesborough and Newtowncashel over both events.